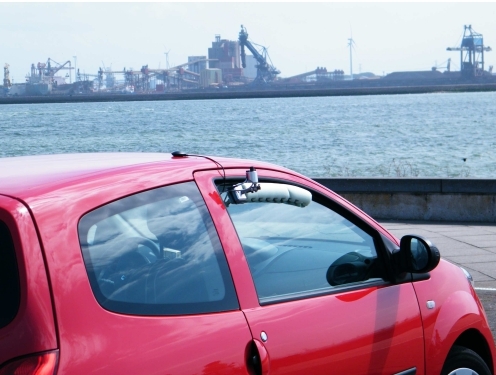 The MAX-DOAS principle is also applied at BIRA-IASB to perform mobile measurements of trace gases from a car. Instead of the scanning system used in our stationnary ground-based MAX-DOAS, we record simultaneoulsy scattered light spectra at zenith and 30° off-axis. The method is well suited for absorbers located close to the surface like NO2. Indeed, the scattering points lie in the free troposphere where we can assume negligible NO2 concentrations. 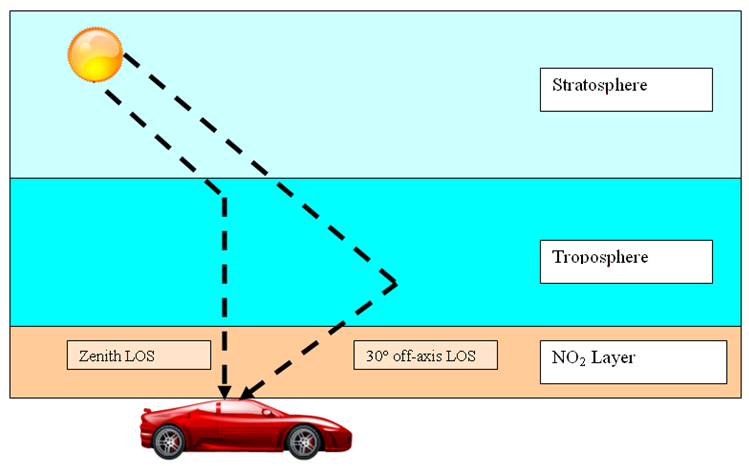 The difference between off-axis and zenith integrated absorptions (slant columns) disentangles thus the boundary layer NO2 loading from the stratospheric contribution. Based on a compact double spectrometer, a Mobile-DOAS instrument was developped at BIRA-IASB and first used during the CINDI campaign. A GPS is used to geolocalize the data and the whole set-up uses the standard 12V from the car. The optical head, with the telescopes and baffles, are mounted on the car window. The instrument is designed to fit easily on any car and to reduce to the minimum the need of an operator. In 2010 and 2011 the instrument was extensively operated across Belgium during clear-sky days. 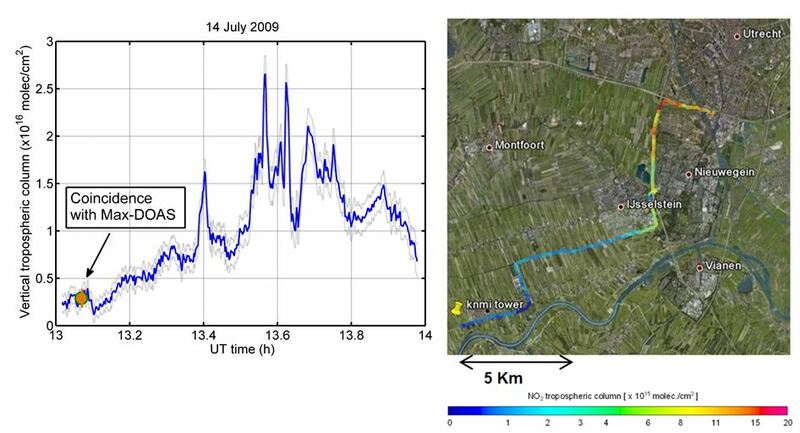 These measurements can be compared with satellite and regional chemical models. The preliminary map shown above indicates the NO2 loading distribution in Belgium. The most polluted areas seen on the map, concerning NO2 are found around Antwerp. An increase is also seen around all major cities (Bruxelles, Mons, Charleroi, ...). The Ardennes regions East of Namur appear very clean, again with respect to NO2, which is understandable from the low population density. From 2011, another BIRA mobile DOAS instrument has been operated in Romania in the framework of a collaboration with the university 'Dunareas de Jos' of Galati. Romania is particularly interesting due to the presence of large SO2 sources, such as coal based power stations. In June-July 2013, the two BIRA mobile DOAS systems were used during the MADCAT campaign, together with another Mobile DOAS instrument from the Max Planck Institute for Chemistry. In september 2014, these instruments were extensively used during the AROMAT campaign, which took place in Bucharest and close to the large power stations of Turceni and Rovinari.